Our sink arrived well packaged and in perfect condition. We took it to the company that is providing the antique marble for the counter top. In the sunlight against the marble it took on a light blue cast but we think it improves the sink rather than detracts. It is like a very light blue sea glass color and so delicate looking we like it much better than a more stark white. Our stone person, who has worked with frosted glass sinks before, told us that this type of sink may also pick up tinges of color from the room in which it resides so to be careful in picking the wall colors. We love it and can't wait to install it in the half bath of the house we are building. 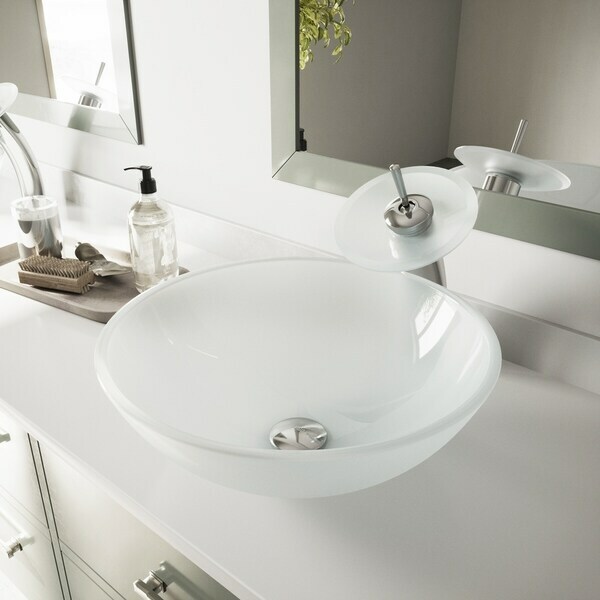 Give your bathroom a sleek, modern look with this classy vessel sink from VIGO. Handmade of solid tempered glass with a frosted white color, this sink is designed to resist scratches and stains from common household cleaners, toothpaste, and cosmetics. With VIGO's limited lifetime warranty, you can rest assured that this sink will look and work perfectly for years to come. I purchased this vessel sink for the clean modern look and it doesn't show water spots like the clear vessel sinks.I'm very pleased with the quality it's sturdy and well made. The sink came well packaged and Vigo is a great brand. I looked at big box stores and plumbing stores and nobody sells vessel sinks! The one(s) they did have if any were cheap looking. This is an awesome color, perfect size, height and everything came together perfect in my new bathroom. I would buy another one. Both sinks I ordered and received were much too blue compared to picture. This is a very high quality, beautiful sink. It didn't work for us because we are installing it into an opening made for an onyx sink so the opening below is too large and you can see the drain etc through the clear glass. I wish it worked, it really is nice. The sinks arrived and...they're not Frosted WHITE. They have an etched like back that is basically frost but the sinks were basically translucent/clear. They are NOT white. I talked first to Overstock. That was a waste of time as I argued with CS about what I received and what is shown in the picture. I offered to send them a pic and they wouldn't take it. I then called Vigo and talked to them. They were basically no help at all. I did send them pictures but was told that the sinks you got are white and match the pictures on the web. You be the judge. My take is that wasn't true. Long story end...It will be a while when I again purchase from Overstock. Great deal, they look good in our modern bathroom. Packaging was good and they arrived early. I purchased another one for our downstairs bathroom because I liked the look and quality of the first one! Beautiful frosted sink! Nice contemporary feel to it! Sink is great. Using it in a wet bar area and very stunning. 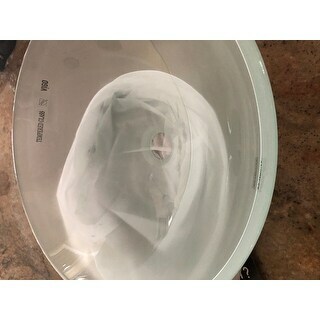 "Is this sink translucent? I am going to under light the onyx counter top in our powder room and want to extend the effect and minimize shadows. I have read there is less water spotting with the frosted glass otherwise I would go with clear." Hello mengler, this is a frosted glass, it is not translucent. Thanks for shopping with us! I was looking for a clear or Starfire vessel sink that had all of the green tones taken out of it. "Many frosted glass sinks have a green tint. Is there any hint of green in this sink? Thanks,"
Hello lisa00000, no, the VIGO White Frost Glass Vessel Bathroom Sink does not have a green tint to it, in our opinion. Have a great day.